Zen is an institution in Belfast with owner Eddie Fung one of the highest regarded restaurateurs in the City. It's popularity over the years hasn't diminished as Eddie constantly evolves the restaurant's look, feel and menu. I always thought Zen was ahead of its time in Belfast and had the feel and atmosphere of a restaurant located in a greater gastronomic city. More Hakkasan than Oriental Delight. Now, having said this I was never a massive fan........Controversial I hear you say. It's not that the food or service was bad, more to do with my preference for Cantonese cuisine rather than Japanese. Give me a choice of either sushi or a Chinese hot pot and it'll be the hot pot. Tempura or roast duck and I'll go for the duck, you get the point. So when I heard Eddie was opening a Chinese focused restaurant I was more than intrigued. I have often said that Belfast has a problem with Chinese restaurants. There are a few excellent ones namely the All Seasons in Botanic, the Lee Garden and perhaps the Macau. But none of them come close to providing the same atmosphere of Zen. Somewhere you would want to spend a whole evening with an extensive drinks menu and music that doesn't make you want to leave as soon as you down your chopsticks. So if Zen could replicate its main restaurant serving great Chinese food it could carve its own niche in Belfast. I arrived on a wet Sunday afternoon for lunch Instead of going to my usual dim sum 'Sunday lunch' in the Lee Garden. I was surprised that the restaurant was completely empty and actually had to ask if it was open. The decor was reminiscent of its older sister with the distinctive smell of incense and dark lighting. All very pleasant. The lunch menu was what you would expect with a limited yet satisfactory range of dishes. Salt and chilli squid is probably my favourite Chinese dish so I opted for that to start along with the jumbo chicken satay and roast duck/char Sui combo for mains. 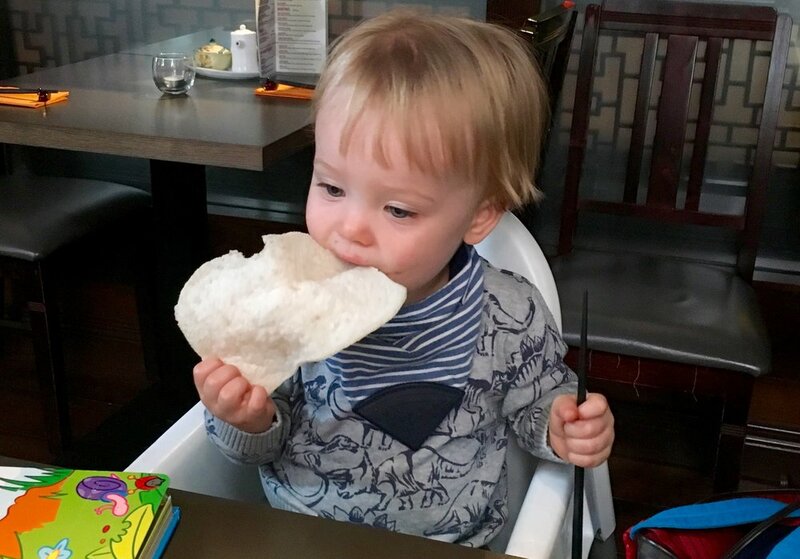 Before the dishes arrived we were presented with palm sized prawn crackers which Teddy loved, it wont be long before he's dipping them in the chilli oil! The squid was fresh and extra crispy with the only criticism being perhaps it had too much batter. In my opinion the All Seasons still tops the Salt and Chilli squid chart. The chicken satay main course was incredible. From my recipe you can see that I am a massive fan of satay and this didn't disappoint. It was presented on a hanging skewer and the chicken was wonderfully succulent and the charred onions and peppers in between each cube where a tasty addition. The true star of the show however was the satay sauce. Rich and creamy and I have to applaud the welcome addition of chilli which many satay sauces lack. Rachel, who is trying her best to eat as healthy as possible, opted for the Duck/Char Sui combo with Bok Choi and boiled rice. We usually order this Chinese BBQ in the Lee Garden which is always excellent so it had a lot to live up to and it came very very close. The Char Sui was nice but in my opinion lacked a certain sweetness but that's nitpicking if i'm being honest. The Duck was excellent and given the name of the restaurant it needed to be. Succulent, flavoursome and sitting in a pool of soy which only enhanced it's rich flavour. The only thing I was disappointed in was Rachel not eating the fat. The service was excellent with the waitress even providing Teddy with toy ducks to keep him entertained between mouthfuls of prawn crackers. I presume the restaurant will be a different place to be on a Friday or Saturday night rather than a damp Sunday at lunch. When all said and done I will definitely be back (probably many times) to try their dinner menu and experience the restaurant with some atmosphere.